Brief Description: Product effectively eliminates phosphates from the aquarium. Unbalanced ratio of nitrate and phosphate levels in the aquarium water leads to development of cyanobacteria and nuisance red algae. Due to its unique composition, AF Anti Phosphate adsorbs phosphates from your water without absorbing vitamins and crucial micronutrients. Maintaining a perfect balance between the phosphate and nitrate levels guarantees crystal clear water and optimal conditions for the growth and development of plants. 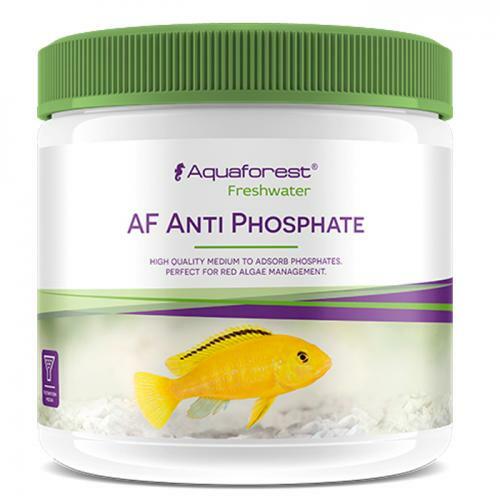 Notify me when "Aquaforest Freshwater Anti Phosphate [500 mL]" is re-stocked. AF Anti Phosphate is especially recommended in tanks with a small amount of plants, overcrowded tanks and Malawi and Tanganyika biotope tanks. HOW TO USE: AF Anti Phosphate should be placed in the filter basket dosing 50 ml of product per 100 l of fresh water.